The day after a storm dropped a few inches of snow, the thermometer breached 50 degrees in New York City and I brought my bicycle out from its dusty basement storage rack. I wiped off the grime with a damp cloth, cleaned the chain, and applied White Lightning, a clean wax lubricant. Slipping a camera around my neck I took my first ride since just after Sandy came through and rearranged the urban furniture. Hey you ‘cyclers out there – take care of the chain and everything it touches will serve you for a long time. I’m talking about derailleurs and cranks mostly. If you ride a lot, spring for a new chain every thousand miles or so. And when you do change the chain, wax lubricants are nice – dry, resist grease and grit and much cleaner than oils or teflons in my opinion. I am a resident tourist and love taking photos in the city. 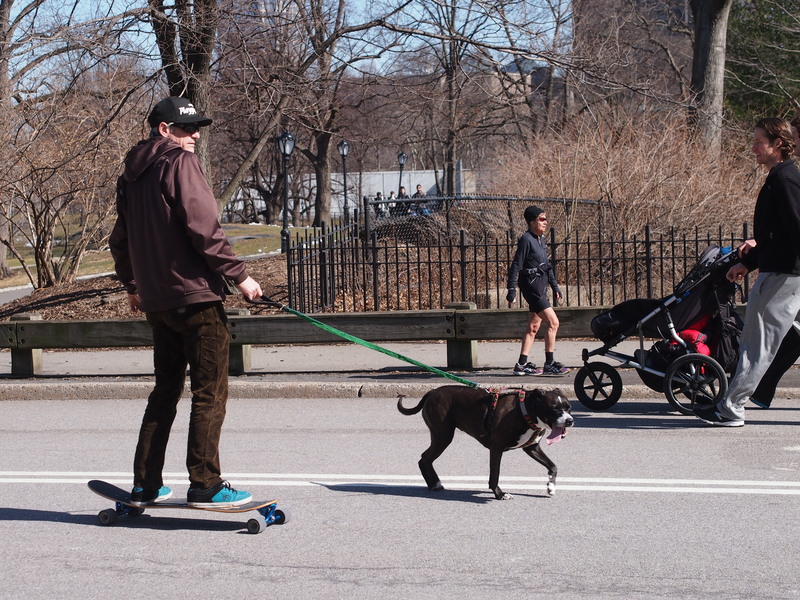 But what I really enjoy is shooting from the saddle and getting a good image while maneuvering park or street traffic. Or passing the image I’m going to shoot, speeding ahead and waiting for it/them to ride by. 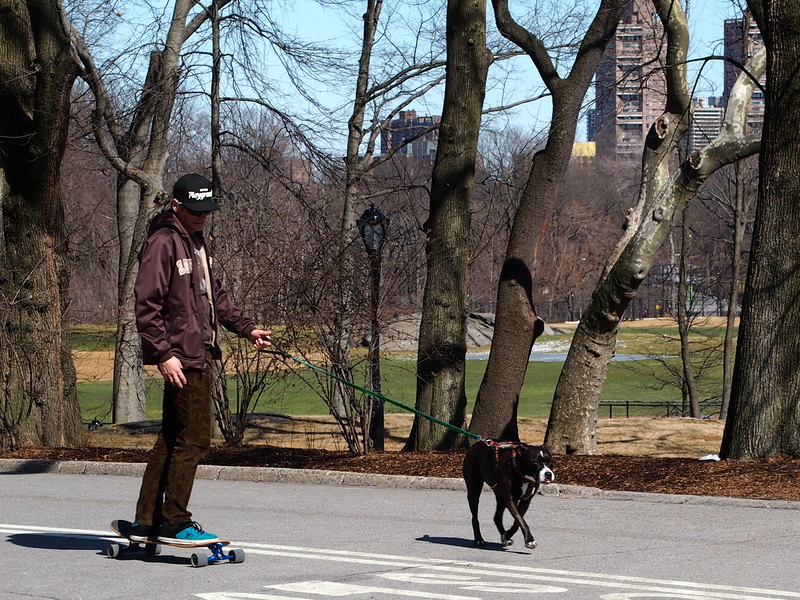 I passed this fellow with his pit bull pulling him up a hill in Central Park. The man kicked the ground to help him up the hill, but his animal did most of the work and seemed quite happy in doing so, tongue flopping around, breathing hard, tail wagging. This was work and most dogs live for work, or some I’m told. I’m not a dog and I live more for days like yesterday and today with a good deal of leisure and a 32GB SD card at my disposal. 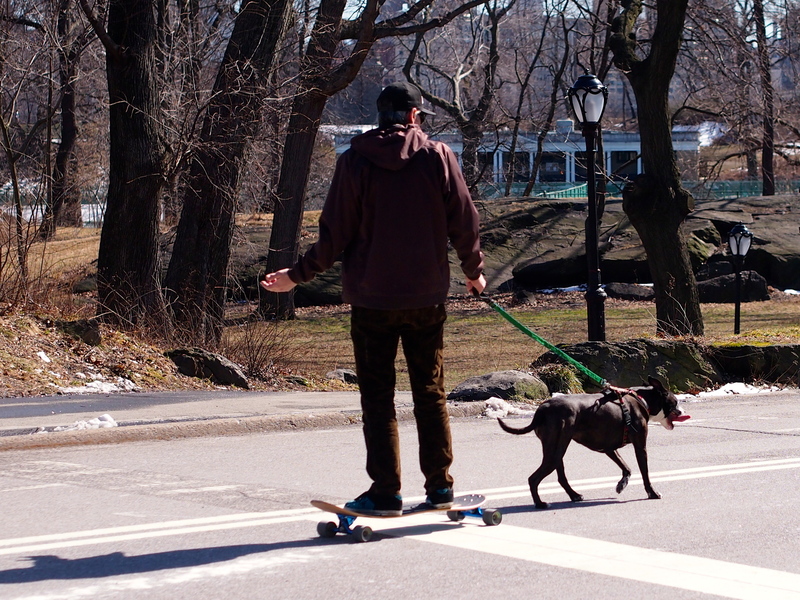 I saw a lot of dog people running with their dogs but none in a basket. It was a short ride as my conditioning is meager. Do you want to see those photos? I do this blog mostly to entertain my wife, family and a few select friends. However, the “like” button has had an influence. I feel unreasonably ecstatic when I get more than a few likes and am hurled into a somber self-critical mood when there are but one or two. 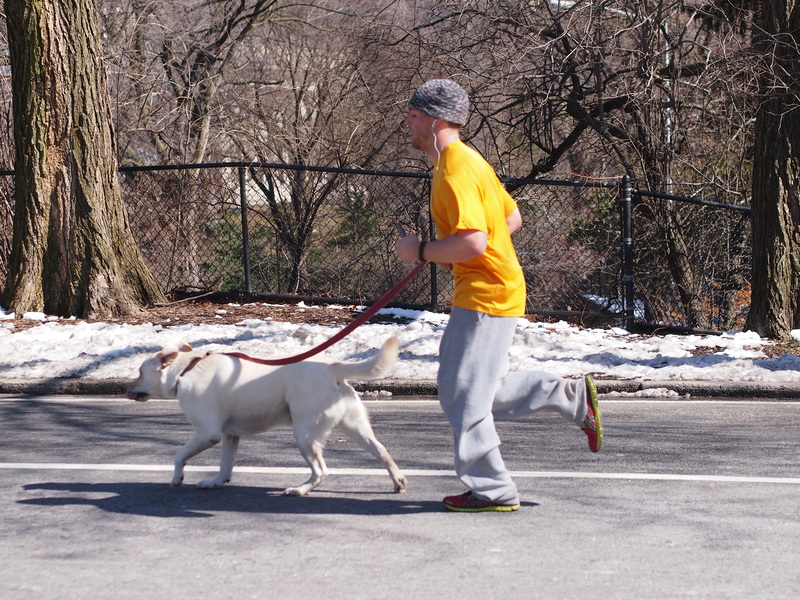 Well, Here’s one of a running dog.